The Slug Rifle is a weapon commonly used by Legionaries, Phalanxes, and Psions. Sometimes Centurions utilize them. These weapons deal Solar damage. These weapons may or may not be linked to the Cabal Battle Network. Some Red Legion soldiers continue to wield them, as do the Loyalists. 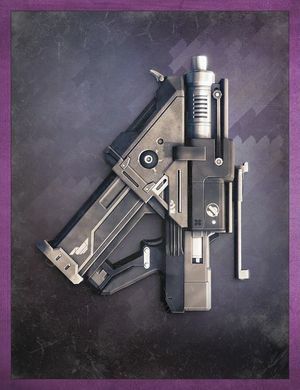 The workhorse of the Cabal field arsenal, this weapon's apparent simplicity belies the technology behind it. Each round is a microrocket capable of efficient operation in varying environmental and gravitational conditions. Standard-issue warheads mount a duplex explosive that combines an armor-piercing penetrator with a flesh-shredding shrapnel bus. Cabal forces on Mars favor rockets with low velocity but high impact, perhaps due to their effectiveness against the Vex. In Guardian parlance, these weapons deal Solar damage. One of these weapons can be found inside the Tower alongside a collection of other Cabal and Fallen weaponry. The Skyburner's Oath is a wieldable Slug Rifle, being an Exotic Energy Weapon Scout Rifle. When the game was being developed, the barrel of the rifle was noticeably longer.